Heavy excavating machinery rumbles relentlessly inside the Madu forest sanctuary — digging into the earth and felling trees — while truckloads of tipper lorries driven by drivers halfway drunk by 11am, packed to the brim with soil dug up, race through the road which runs through the sanctuary. Both the road and the excavation sites are new additions to this landscape which was declared an environmentally protected area in 1968. Like many of the protected, environmentally sensitive areas in the north, the 21,000 hectare Madu forest sanctuary is also facing an onslaught by government sponsored unplanned development activities. 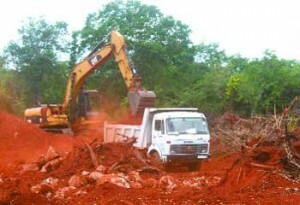 Although Article 6 of the Flora and Fauna Protection Ordinance (FFPO) prohibits clearing or breaking up any land for ‘cultivation, mining or for any other purpose’, the Geological Survey and Mines Bureau (GSMB) has allowed four contractors, including Indian railway giant IRCON and Sierra, to excavate soil from the sanctuary. The soil excavated is used to build roads in the Northern Province. A government official stationed in the area stated that the bureau has given permission to excavate soil from the protected area, in consideration of the ‘importance’ of development. “The contractors can only dig the earth under strict guidelines. They cannot dig deeper than 3 feet, can’t cut trees or dig close to the road which runs through Madu,” he said. Not only has the GSMB exceeded its mandate by sanctioning excavation and the felling of trees, it has also not implemented a monitoring mechanism which would make sure that the contractors adhere to the above mentioned guidelines. In addition, the statements made by GSMB and officers like the one who spoke to us indicate that they never visit these sites where their ‘conditions’ have been brazenly violated. “The contractors are blatantly violating the conditions because there is no one to monitor their activities. The police take no action, the mining bureau is nowhere to be seen, while the army, which at least seems to be concerned, has no authority over the matter,” said a resident of the area. Almost all excavation sites are given a license authorizing the contractor to excavate between 500-530 cubic metres of soil a month from a site of one hectare and a tipper lorry which transports the soil can carry only 12 cubic metres per month. However the army officers stationed nearby told us that a single tipper transports that amount in less than a week. “We write everything down and we can prove that they are breaking the terms of the contract but we have no authority to act. The police who can inspect this are nowhere to be found and as for the 523 cubic metres a month limit, just take a look at the site,” said an army officer stationed at Madu who volunteered to take us to excavation sites. The excavations look like a blast site in a disaster movie. Although it is officially prohibited to dig deeper than 3 feet, all the sites have been dug up close to 12 feet. That makes another condition of the license – the contractors are not to fell trees – redundant. There is ample evidence that many large trees have been felled and the valuable timber has been taken away, most probably by the politicians who back the contractors. “All the contractors, maybe except the Indians, are backed by national level politicians. When the army prevented excavation on Sundays, many local and national politicians tried to intervene and revoke that decision. Still whenever relevant authorities try to stop any wrongdoing there is massive political pressure exerted,” the officer added. When we point to the site superintendents that trees have been felled and that they have exceeded the depth level manifold times, they just shrug their shoulders and smile shyly, mostly because there is an extremely angry but hapless army officer next to us, while the backhoes keep on excavating and putting the soil into tippers manned by drunken drivers who speed through the gravel roads raising clouds of dust. “They have been told that they have to cover the soil while transporting because the lorry route takes them through many populous areas. The route of the tippers goes past several schools, miner towns, army camps and sentry posts. But no one does this apart from IRCON. Finally we have managed to convince them to wet the areas near bunkers, schools and other populous areas, but for that to happen the army had to intervene heavily,” the officer who seemed to be genuinely concerned about the colossal damage to the environment and people’s health told us. He pointed out that in addition to the soil excavation the Department of Wildlife has given permission to several local businessmen to cut small trees from the sanctuary. The tree trunks are used to build enclosures in prawn and shrimp farms and are sold at Rs.150 each. “Those who do this tell us that the licenses are given only if they give a cut to the officials. On many days we come across hundreds of such trees which are cut, and it is inevitable that by allowing this the wildlife officials are inviting timber rackets,” the officer said. However the Vavuniya office of the Wildlife Department denied that they have given permission to cut trees inside the sanctuary. The forest patches of the north and east are home to unique ecosystems and animals which cannot be found in other parts of the country. They are also the catchment areas for the extremely limited number of water sources in the region where the majority of the people are farmers expecting to rebuild their lives destroyed by the 30 year civil war. The future prosperity of the majority of the citizens of the country are interlinked with our natural resources and by the systematic destruction of the ecologically sensitive areas the Sri Lankan government is directly menacing their livelihoods. Appreciate this writer have gone out of his way to highlight this racket and the absolute powerlessness of the environmental protection laws. Can the people in authority start taking action and monitor these brainless and profit making contractors. We need development yes but without sustainability we are destroying everything. Please Can the army be put in good use to monitor the environmental laws in these areas? ?